Property owners have a legal responsibility to maintain their property, which can include stores, parking lots, stairwells, warehouses, land, amusement parks, movie theaters, and even a private residence. When property owners fail to keep their property in a reasonably safe condition, people can get seriously hurt. 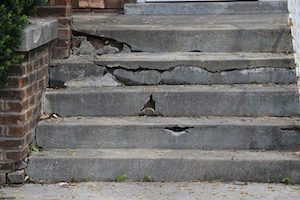 Although most people associate premises liability cases with slips and falls, a property owner’s negligence can lead to a wide variety of injuries. At Mesirow & Associates, PLLC, we help people who have been injured due to accidents in stores, apartment buildings, homes, and other properties. If you’re struggling to pay medical bills and other costs associated with an injury on another person’s property, we can help. Residents of the Metro D.C. area and the surrounding communities are well aware of the hazards of walking around the city in the middle of winter. Icy, snowy sidewalks, slick stairs, and puddles of slush make it tough to get around. Most people take safety precautions, such as wearing boots and taking their time as they contend with severe weather. No matter how careful you are, however, you can’t control how a property owner looks after his or her property — or fails to look after it. Broken sidewalks, iced-over stairs, and store entrances covered in slush can cause an unexpected and life-changing accident. Premises liability claims can also arise in other types of situations, such as around swimming pools, at camping sites, and in downtown parking lots. For example, owners and operators of public and private swimming pools and facilities have an obligation to properly maintain their pools and the areas around the pool. Depending on the circumstances of the case, they may also have an obligation to install fencing or hire lifeguards. A slip and fall on a wet surface surrounding a pool, or a drowning accident caused by a lack of supervision can give rise to a premises liability claim. At a campsite, amusement park, or other facility, property owners are held to the same maintenance standards as other property owners in the same industry. This means that they must use the same care as reasonable property owners in their area and in the same type of environment. For example, a property owner who operates scenic tours in a mountainous region will likely be held to a different standard of care than a property owner who conducts white water rafting excursions. Owners of apartment buildings and property owners who maintain properties in high-crime areas also have a responsibility to ensure that their properties are safe. For example, property managers and owners must install working locks on doors and windows, and they must restrict access to interior doors that lead to apartment units. In some cases, a property owner has a duty to hire security professionals or to install surveillance cameras. At Mesirow & Associates, PLLC, we help clients throughout Washington, D.C., Maryland, Virginia, and the surrounding areas. If you have been hurt on another person’s property, or you have suffered an injury in a store, parking lot, club, or other property, you may be entitled to compensation for your injuries. We offer free consultations, and you pay nothing unless we recover money on your behalf. Speak to a Washington dc premises liability lawyers today about your case by calling 866-463-0303.